1. เกจความสูง 50 มม. ความเที่ยงตรง 0.005 มม. 1. For setting tool length on machining centers or CNC lathes. 3. Large measuring surface for ease of use. 4. Low spring force to avoid breakage of small end mill and drill. 5. 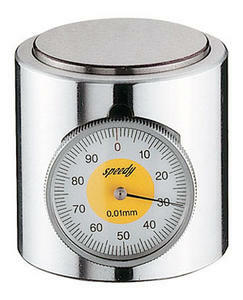 Easy to be calibrated by a ground parallel or gauge block. 6. Better parallelism, sensitivity and precision. 7. Outside Diameter 52 mm.